1. a) Put the cashews into a bowl, or 2-cup measure, cover with water, and let sit overnight ~8 hours. * b) Put the cashews into a heat-safe bowl, and cover generously with boiling water. Let sit for ~2 hours. 2. After soaking period is over, using a fine colander, drain the water off of the cashews, discarding the water. Rinse cashews well. 3. Put the drained and rinsed cashews into a small blender with 1/2 to 1 cup fresh water. 4. Blend on high speed until the cream is smooth, and at your desired consistency. Add a pinch of salt, if desired. Close lid of Instant Pot, and set to Manual > High Pressure > 30 minutes. When pressure cooker beeps, either let stand for 10 minutes and open after releasing remaining pressure, or let pressure release naturally. Mash the contents with a potato masher, or blend with a hand blender. Let it rest for a minute or two to let the cheese melt, then stir gently to combine. It will thicken a great deal as it cools. In a large non-stick pan, cook red pepper, zucchini, yellow squash, onion, and mushrooms in the olive oil over medium heat for about 7 minutes, or until just tender. Remove vegetables from pan. Coat the same pan with cooking spray, and place one tortilla in pan. Sprinkle ¼ cup of the cheese evenly over the tortilla, and layer ¾ cup of the vegetable mixture over the cheese. Sprinkle another 2 Tbsp of the cheese onto the vegetables, and top with a second tortilla. Cook until golden on both sides, for approximately 2 to 3 minutes per side. Remove quesadilla from pan, and repeat with remaining ingredients. 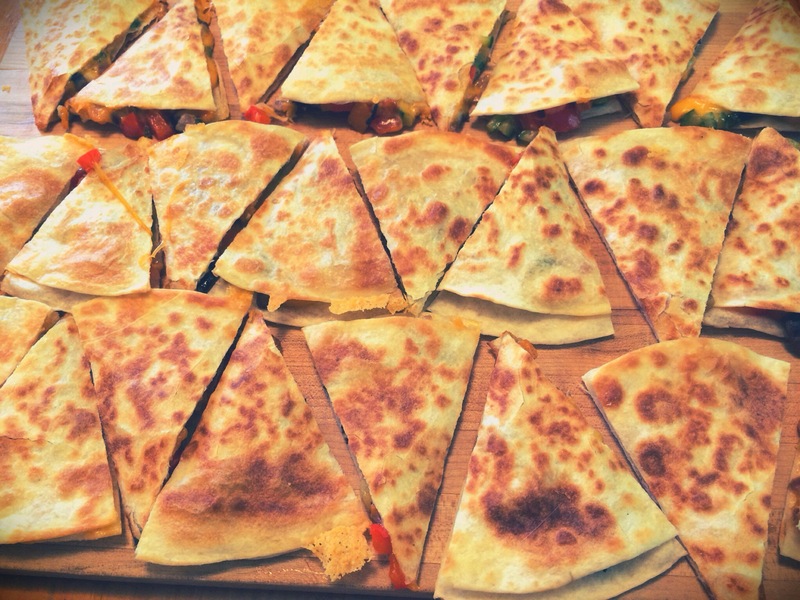 Cut each quesadilla into 8 triangles with a pizza cutter.